Two of our dear dog blogging friends have launched fundraising efforts in memory of their recently departed canine pals. This holiday season, as a personal favor, I’m asking you to consider making a donation. Details below. After putting time, energy, and love into Operation Spoil Frankie, our friend Edie from Will My Dog Hate Me said goodbye to her first-ever dog, Frankie. His decline due to Canine Cognitive Dysfunction had taken too great a toll. Edie is channeling her grief into good deeds for other senior pets through the Grey Muzzle Organization — specifically to people who provide Forever Foster homes for aging and ill dogs. These volunteers often shepherd dog after dog in their final days. 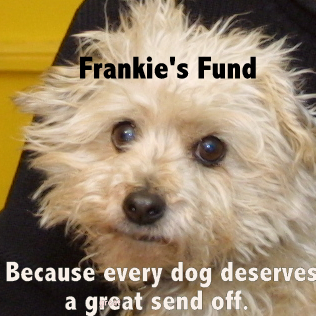 You can find details on how to donate on Edie’s blog. Lilly and I made a donation earlier this week. We hope you’ll join us. Our friends Leo, Kenzo and family over at Kenzo the Hovawart also recently said goodbye to their lovely girl Viva, when her Cushings Disease and Discoid Lupus became too much. You can find details on how to make a donation, including an explanation of what the online donation form (in Danish) says on Kenzo’s blog. 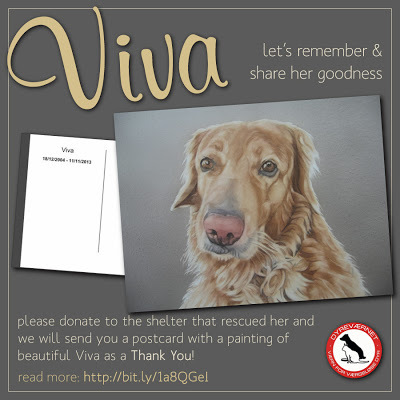 Funds go to the rescue organization from which Leo’s family adopted Viva. Lilly and I already made our donation, and I’m happy to say that my credit card bill made the correct conversion of our donation into U.S. dollars. We’re asking you to take just a little of your holiday budget to help our friends do good things in memory of their beloved dogs. Nice post, thank to share it with us. I love the pets, it’s really a great and wonderful idea. I really do think that the only good thing to do with grief — when you can finally bear it — is to try to make a difference for others. Lovely to hear what these bereaved owners are doing. What a lovely way to remember a cherished pet. Donna Hull recently posted..Have You Bid on a Passports With Purpose Prize Yet? Pamela recently posted..Your Dog’s Leash – Is it a Steering Wheel or a Communication Tool? Your are the best Roxanne. And I say it again, all the empathy you can muster for others while you yourself are in such a difficult situation… it is amazing and heart-warming. Thank you so much. This is lovely. It’s so wonderful to honor our pets this way and to give to other pets, too. Truly. Thank you so much for passing the word along! I hope to have my website fixed by tomorrow but in the meantime… this is so kind of you.